The Viqua Sterilight Silver traditional UV systems use the Sterilume-EX UV lamps. These lamps are a low pressure, regular intensity mercury vapour lamp. They utilize 425 mA of current to fire at a 254nm wavelength of light. At a wavelength of 254nm microorganisms are inactivated, therefore the water becomes disinfected. Sterilume-EX UV lamps have a proprietary stepped 4 pin configuration which couples with the ballast connector. The Sterilight UV lamps hold a one year warranty. All prices are plus V.A.T and delivery. This genuine Viqua Sterilight S287RL Lamp is the regular intensity original replacement UV bulb for Sterilight S1Q-PA, S1Q-PA/2, SC2.5, SC2.5/2 & SSM-14 water disinfection UV systems. Sterilume-EX lamps can be used in older style Sterilight units, such as S1Q-PA, S1Q-PA/2, SC2.5, SC2.5/2 & SSM-14 systems. Sterilight S287RL UV lamps have a full one-year warranty and have been tested in order to deliver a specific UV intensity in each system that is offered. For 2-2.5 gallon per minute units. 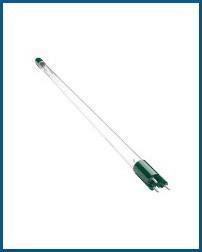 This genuine S287RL Sterilight UV lamp can easily be identified by the green bulb base. 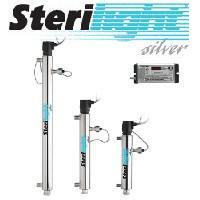 The Sterilight S36RL UV lamp can be changed without interrupting the water flow. The Sterilight QS001 Quartz Sleeve is available below, the replacement quartz sleeve for the S287RL UV Lamp.